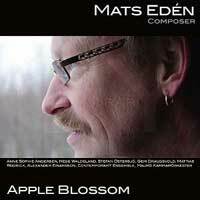 An album that focuses on Mats Edén as composer, with 16 performances of his pieces played by a variety of artists in a number of styles from folk to classical to contemporary art music. "In 2006 I wrote the piece “Den flygande kofferten” for the cellist Mette Spang-Hansen. The reason for this particular commission was her diploma concert from Det Fynske Musikkonservatorium. It was a fun and inspiring commission to work on. After a few years I met her again, this time at my workplace at the Malmo¨ Academy of Music where she was visiting the student and violinist Anne Sophie Andersen. Mette asked me how the violin concerto was coming along, the one that I began once I was finished with her piece. I replied that it was complete but that there were no imminent plans for its performance. At this point, her friend showed an interest and wondered if I could send her the music. I promised I would, and after just a few days Anne Sophie phoned and requested a reduced piano-score in order to be able to rehearse with a pianist. On the way to one of the rehearsals she told of her plans for a concert and CD recording, the result of which you now find here. What you, the listener, are now sitting with is a selection of my reflections as a musician and com- poser over the years, which have taken shape as music. Some of them lie very close to the music I myself play today; others lie within a more experimental tonal language. Some of the compositions on the album, such as Mumma, Memento and Waldeleken, have been written in collaboration with musicians I have met. Others are expressions for different types of ex- periments and mixings of styles, which interest me as a musician and composer. It is not possible for everything to fit onto one CD, and the music you can listen to here does not give a complete picture of my writing, but I hope that your ears can enjoy a pleasant moment in the company of the good musicians who have entered into “The Garden of Edeìn” and that they can sense the cool scent of the blossoming apple trees.